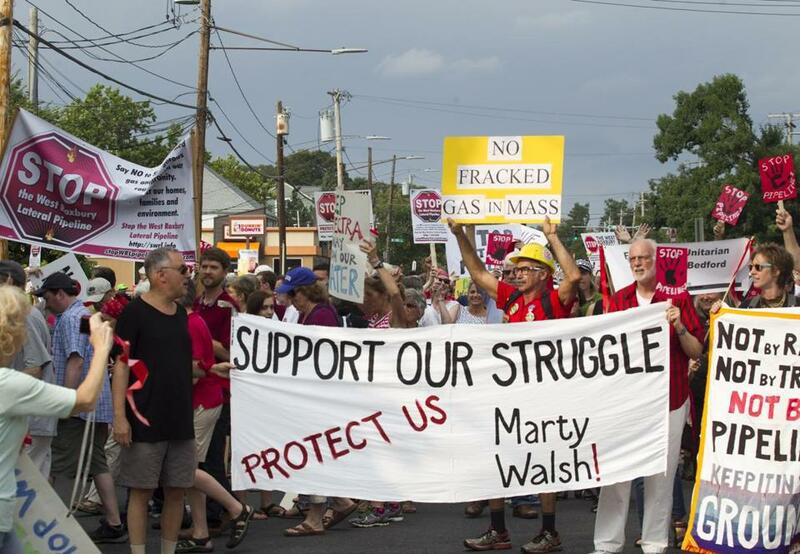 Hundreds of anti-pipeline activists rallied, marched and demonstrated in Dedham on Sunday afternoon. 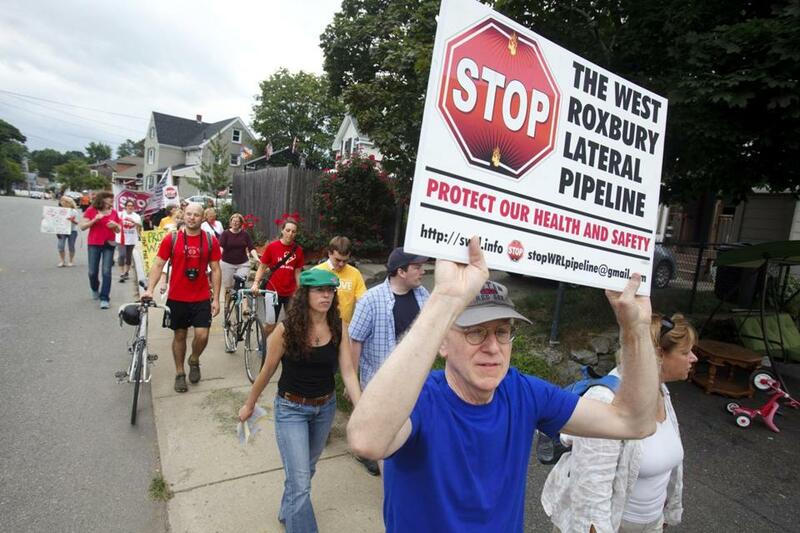 DEDHAM — More than 200 protesters chanted, drummed, and marched along the proposed route of the controversial West Roxbury Lateral gas pipeline on Sunday afternoon. “Fee-fi-fo-fum! 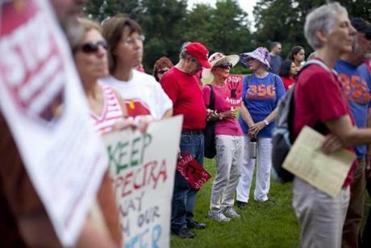 Look out Spectra, here we come,” chanted the protesters, many of whom were wearing red. At 3 p.m., local religious leaders led a service at a field near Dedham’s downtown, followed by a rally at 4 p.m. The protesters marched to Boston’s West Roxbury border with Dedham, where they held hands to form a “human chain” for several minutes. Rabbi Shoshana Meira Friedman of the Temple Sinai of Brookline said climate change is the pressing moral issue of our time, and religious leaders must speak out against practices that are destroying the environment. “The continuity of a livable planet starts in these very small and symbolic moments,” she said as she walked with the protesters. The proposed gas line expansion would run beneath parts of Centre, Grove, and Washington streets in West Roxbury, as well as through Dedham and Westwood. Emily Kirkland of the Better Future Project, one of the rally’s organizers, said residents are worried about the pipeline’s proximity to an active quarry and its negative impact on the environment. “Every dollar we invest in this pipeline is a dollar we are not investing in wind or solar,” she said. Spectra has proposed a $1 billion, 5.1-mile expansion of the Algonquin Gas Transmission pipeline that runs from New Jersey to Boston. The line would run beneath parts of Centre, Grove, and Washington streets in West Roxbury, as well as through Dedham and Westwood. A metering and regulation station would also be built outside the entrance to a quarry on Grove Street. Boston politicians have sided with neighbors who say the gas line’s proximity to the gravel quarry poses a threat to public safety. The town of Dedham and city of Boston are engaged in legal battles with Spectra over the pipeline. Spectra has said the pipeline expansion is necessary to increase the supply of natural gas to its customers, including NStar and National Grid. Marylee Hanley, director of stakeholder outreach for Spectra, said in an e-mailed statement that the pipeline will provide homes and businesses with a “more affordable, environmentally friendly energy source” to New England. David Gallogly of Roslindale was among the anti-pipeline activists who rallied against the Algonquin Gas Transmission expansion on Sunday.